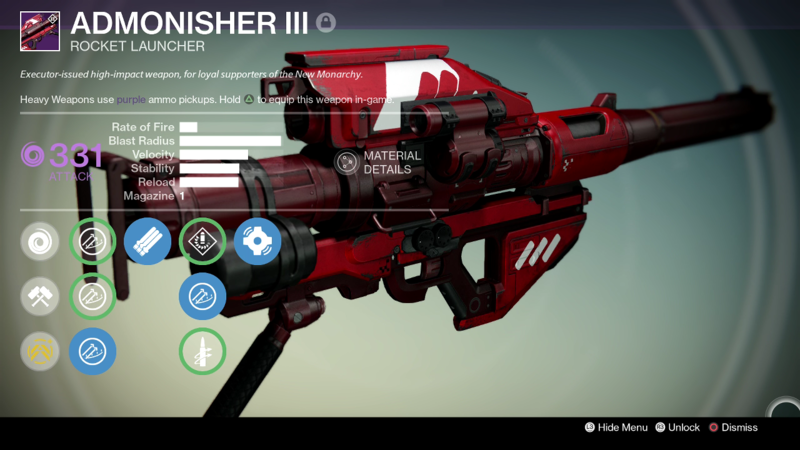 The Admonisher III is a New Monarcy rocket launcher in the House of Wolves DLC. It falls in the high blast radius group of rocket launchers.. much like the Radegast’s Fury, Tomorrow’s Answer, and the Ash Factory. You can get it from Cryptarch packages, from New Monarchy packages, the Nightfall, or you can buy it from the New Monarchy vendor in the tower for 150 crucible marks. Stock it comes with the highest blast radius available, only one round in the chamber and middle of the road velocity. We can’t roll perks that increase rate of fire, and reload speed and stability are unimportant on a rocket launcher, so we are going to reforge for higher velocity, blast radius, and magazine size. Here is the break down of my perk choices and what to reforge for. Hard Launch / Aggressive Launch – Increases Velocity and Blast radius, but increases recoil. Tripod – Launcher can hold 3 rounds in the tube (instead of just 1). Grenades and Horseshoes – Rockets detonate early based on proximity to targets (allows you to fire without having to aim down sights). Even though the Admonisher III comes stock with mediocre velocity and the smallest magazine available, because of the perks we can roll for, you can really push the blast radius and velocity to the max. Also with tripod you can up the magazine from 1 to 3, making this a great heavy weapon to take with you in the crucible. Personally I think it is the BEST rocket launcher out of all the high blast radius launchers. I actually prefer it over my Tomorrow’s Answer or my Ash Factory. Thanks for checking out my review, please leave me a comment with the perks you use and like or if you want a review of a certain destiny weapon let me know, thanks.